I've recently started re-watching the excellent-but-canceled series Life, the occasionally flawed but usually brilliant, unique, and entertaining cop show starring Damian Lewis and Sarah Shahi. Shahi was amazing in this series, strong and smart and and one of the few petite women I've actually believed could be a detective in real life. No blank-eyed starlet here; Shahi was able to be tough, aggressive, clever, sarcastic, quick with her gun, and of course, just a bit damaged. She and the equally talented Lewis (Band of Brothers) had a striking chemistry on Life, and it's a shame that the writer's strike, and audience confusion over a show that defied labeling, killed this stellar TV series well before its time (though it did at least have a beautiful and satisfying final episode). Now Shahi has a new series, called Fairly Legal. The show debuts on USA on Thursday, January 20, 2011, at 10pm ET (9pm CT). Formerly titled "Facing Kate", Fairly Legal will focus on top lawyer Kate Reed, who leaves the corruption of the legal system behind to "actually help people" by becoming a mediator. Kate will also be dealing with the sudden death of her father, the "evil step-mother" who now runs his law firm, and her on-again off-again relationship with ex Justin (BSG alum Michael Trucco). The trailer isn't quite selling me on the show; it's trying a little too hard to be "quirky" and "funny". The moment I like best in the trailer is the exchange with Kate's assistant Leonardo (Baron Vaughn)--and Leonardo's evil laugh. USA shows tend to have great banter and a sly sense of humor, so I'm hoping that Fairly Legal will be as quick with the wit as White Collar, Burn Notice, and even the fairly fluffy Covert Affairs. Fairly Legal will follow USA's surprise hit Royal Pains, and that's probably a good match in tone. Shahi definitely has talent, and she was adept at handling the absurd in Life, so she could make it work in Fairly Legal. USA has been churning out plenty of successful series of late, so Fairly Legal is worth a look for a few episodes to see how the series is going to pan out. Especially since TVSquad reports that Richard Dean Anderson (Stargate SG-1, MacGyver) is set to appear in a 5 episode arc. Fairly Legal will air on USA, Thursdays at 10/9c. 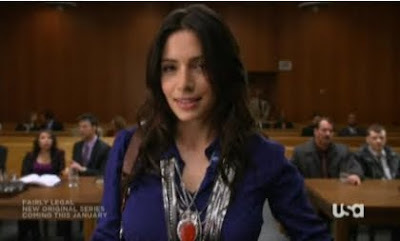 PHOTO: Sarah Shahi as Kate Reed in USA series Fairly Legal, screencap c2010 Universal Cable Productions, USA Network. Sources: USA's Fairly Legal promo page, HitFix, and TVSquad.